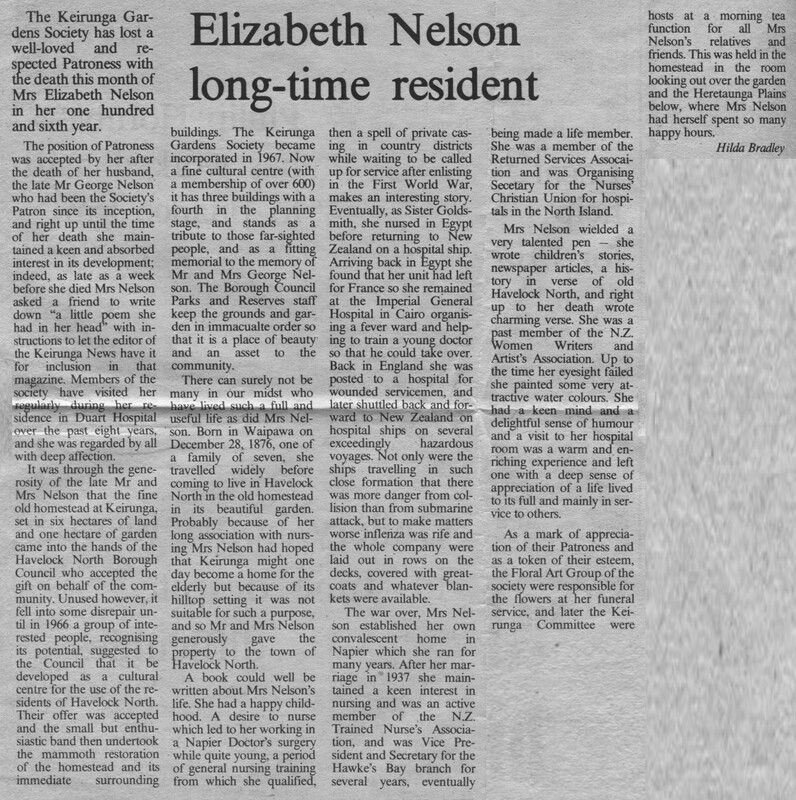 The Keirunga Gardens Society has lost a well-loved and respected Patroness with the death this month of Mrs Elizabeth Nelson in her one hundred and sixth year. The position of Patroness was accepted by her after the death of her husband, the late Mr George Nelson who had been the Society’s Patron since its inception, and right up until the time of her death she maintained a keen and absorbed interest in its development; indeed, as late as a week before she died Mrs Nelson asked a friend to write down “a little poem she had in her head” with instructions to let the editor of the Keirunga News have it for inclusion in that magazine. Members of the society “have visited her regularly during her residence in Duart Hospital over the past eight years, and she was regarded by all with deep affection. It was through the generosity of the late Mr and Mrs Nelson that the ﬁne old homestead at Keirunga, set in six hectares of land and one hectare of garden came into the hands of the Havelock North Borough Council who accepted the gift on behalf of the community. Unused however, it fell into some disrepair until in 1966 a group of interested people, recognising its potential, suggested to the Council that it be developed as a cultural centre for the use of the residents of Havelock North. Their offer was accepted and the small but enthusiastic band then undertook the mammoth restoration of the homestead and its immediate surrounding buildings. The Keirunga Gardens Society became incorporated in 1967. Now a ﬁne cultural centre (with a membership of over 600) it has three buildings with a fourth in the planning stage, and stands as a tribute to those far-sighted people, and as a fitting memorial to the memory of Mr and Mrs George Nelson. The Borough Council Parks and Reserves staff keep the grounds and garden in immaculate order so that it is a place of beauty and an asset to the community. There can surely not be many in our midst who have lived such a full and useful life as did Mrs Nelson. Born in Waipawa on December 28, 1876, one of a family of seven, she travelled widely before coming to live in Havelock North in the old homestead in its beautiful garden. Probably because of her long association with nursing Mrs Nelson had hoped that Keirunga might one become a home for the elderly but because of its hilltop setting it was not suitable for such a purpose, and so Mr and Mrs Nelson generously gave the property to the town of Havelock North. A book could well be written about Mrs Nelson’s life. She had a happy childhood. A desire to nurse which led to her working in a Napier Doctor’s surgery while quite young, a period of general nursing training from which she qualiﬁed, then a spell of private casing in country districts while waiting to be called up for service after enlisting in the First World War, makes an interesting story. Eventually, as Sister Goldsmith, she nursed in Egypt before returning to New Zealand on a hospital ship. Arriving back in Egypt she found at her unit had left for France so she remained at the Imperial General Hospital in Cairo organising a fever ward and helping to train a young doctor so that he could take over. Back in England she was posted to a hospital for wounded servicemen, and later shuttled back and forward to New Zealand on hospital ships on several exceedingly hazardous voyages. Not only were the ships travelling in such close formation that there was more danger from collision than from submarine attack, but to make matters worse inflenza [influenza] was rife and the whole company were laid out in rows on the decks, covered with greatcoats and whatever blankets were available. The war over, Mrs Nelson established her own home in convalescent home in Napier which she ran for many years. After her marriage 1937 she maintained a keen interest in nursing and was an active member of the NZ. Trained Nurse’s Association, and was Vice President and Secretary for the Hawke’s Bay branch for several years, eventually being made a life member. She was a member of the Returned Services Assocaition [Association] and was Organising Secetary [Secretary] for the Nurses’ Christian Union for hospitals in the North Island. Mrs Nelson wielded a very talented pen – she wrote children’s stories, newspaper articles, a history in verse of old Havelock North, and right up to her death wrote charming verse. She was a past member of the NZ. Women Writers and Artist’s Association. Up to the time her eyesight failed she painted some very attractive water colours. She had a keen mind and a delightful sense of humour and a visit to her hospital room was a warm an enriching experience and left one with a deep sense of appreciation of a life lived to its full and mainly in service to others. As a mark of appreciation of their Patroness and as a token of their esteem, the Floral Art Group of the society were responsible for the flowers at her funeral service, and later the Keirunga Committee were hosts at a morning tea function for all Mrs Nelson’s relatives and friends. This was held in the homestead in the room looking out over the garden and the Heretaunga Plains below, where Mrs Nelson had herself spent so many happy hours.